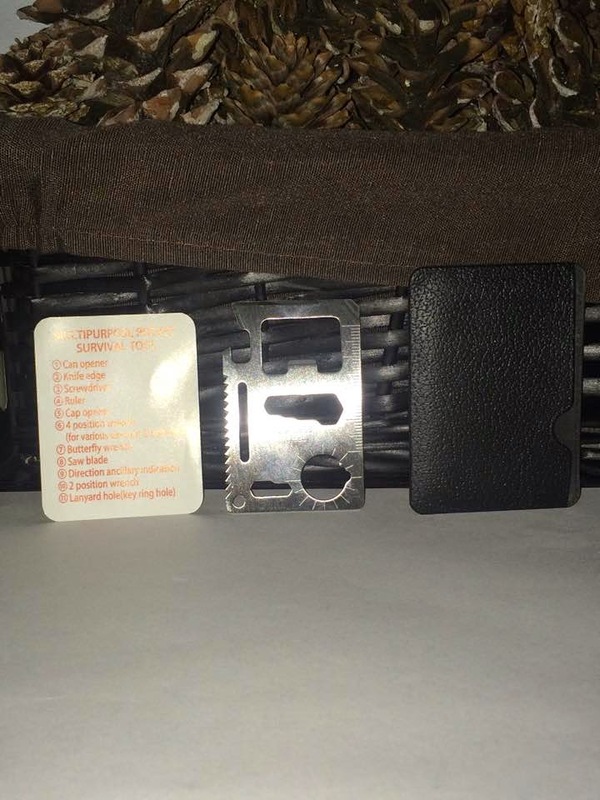 11 in 1 Credit Card Wallet Knife. 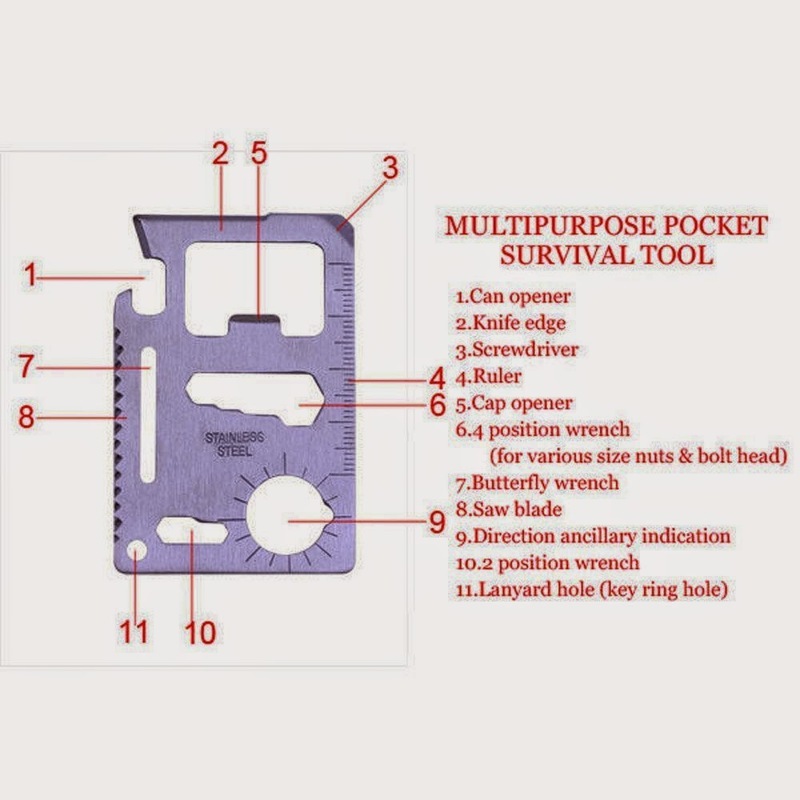 Stainless Steel Survival Multitool Utility. Perfect Tool for Bug Out Bag, Camping or Fishing. 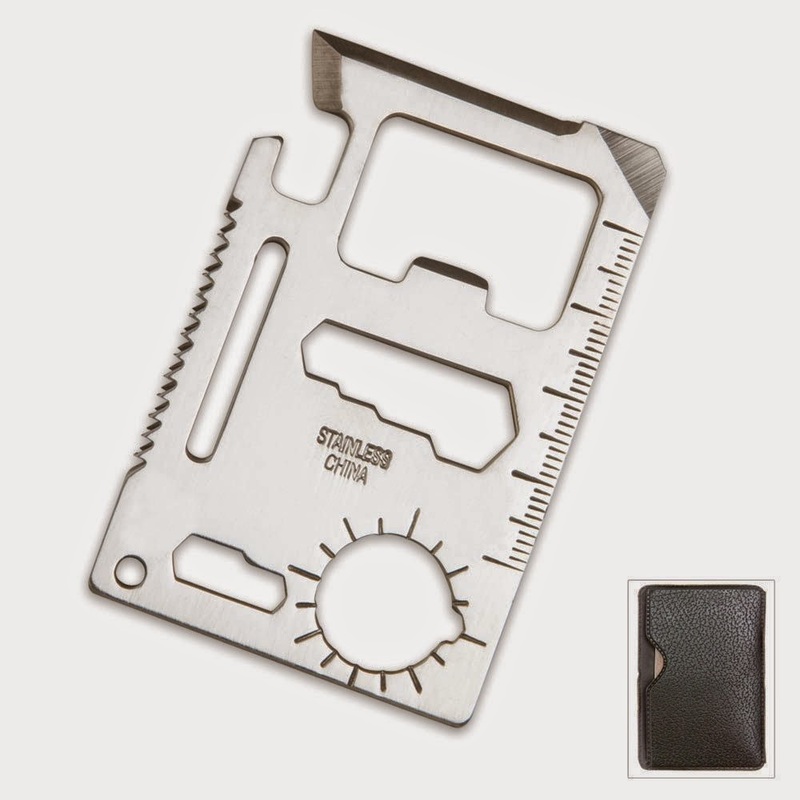 Tools Include Knife, Saw, Bottle Opener, Can Opener, Slot Head Screwdriver, Ruler, 4 Position Wrench and More! 11 Useful Tools - Includes 11 tools that are perfect for every day use. 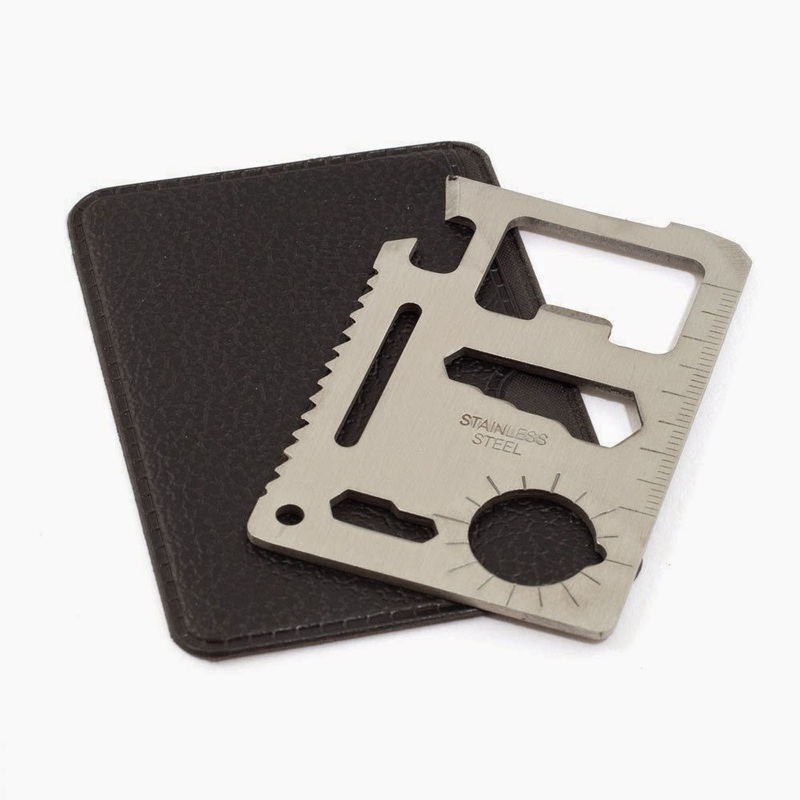 Made of Solid 420 Stainless Steel - perfect for wallets, glove box, overnight bags and bug-out-bags. Easily Fits in Your Wallet - Only 2.68" x 1.78" x 0.079". Fast Shipping - Ships direct from Amazon for lightning fast delivery. 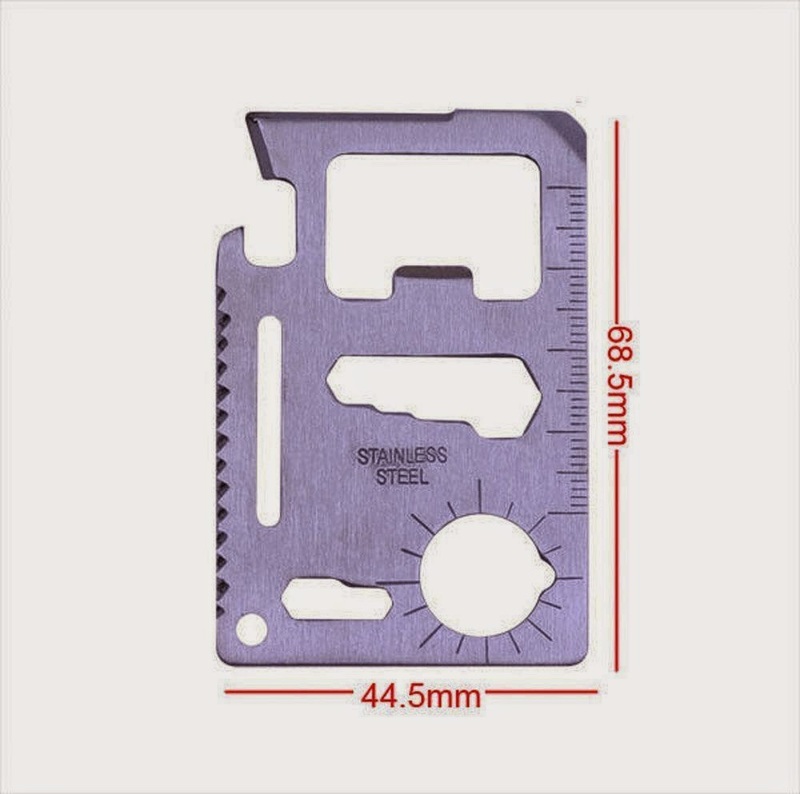 This wallet sized credit card knife and multitool is the perfect mini survival tool for camping, hiking, backpacking, hunting, trail riding Functions: Can opener Knife edge Screwdriver Ruler Bottle opener Butterfly screw wrench 2 position wrench Saw blade Direction auxiliary indication 4 position wrench Key chain hole Specifications: Material: 420 high quality stainless steel Size: about 6.9 x 4.5x 0.2cm(2.68" x 1.78" x 0.079") Weight: about 30g Hardness: 55HRC Package included: 1 x Mini Multi-tool 1 x Black case. I was happy to get to try the Credit Card Multitool by Rayburn Fishing. 11 in one tool sounded like something I could really use in a pinch while out camping, fishing, hiking, taking out on the trail with ATV's or out on a day trip in the car. I really like that it is so compact and can be stored easily and tucked away until you need it. The sharp parts of this tool are VERY sharp! I like that it has a lanyard hole so that I can attach a lanyard and attach that lanyard to anything I want so that it does not get misplaced and is always there when it is needed. This would be a nice gift for any outdoorsman. This is the most beautiful thing that I have found on a blog or website. Finding them always makes me feel lucky!